Years ago, I read the Phantom Detective novel from this issue in one of those little Hanos reprints from Greece that had the tiny print. I probably wouldn't even attempt to read print that small these days, but that wasn't exactly the Golden Age of Pulp Reprints back then so I was glad to get even the Hanos volumes. I've never forgotten that distinctive cover. As for the novel itself, it's by George A. McDonald, one of the better Phantom Detective authors, writing under the Robert Wallace house-name, and I don't recall anything about it except that I liked it. I've read a bunch of Phantom Detective novels over the years, some in reprints and some in the original pulps, and always enjoyed them. Yeah, I've still got some of those Hanos books I'm replacing with better reprints as they come out. They were great at the time because most of this stuff wasn't available anywhere. Hanos tried to trade me some pulps once, but when I got his, they were all trimmed down to digest size, just barely catching all the text. I sent them back to him. Yeah, I still have Hanos reprints, and have not ventured to read any of that fine print for many years. I read three of his Phantom Detective reprints, my favorite of which was 1934's The Crimson Killer. Some extreme pulp villainy going on there. Hanos also turned me on to Secret Agent X and, best of all, the Jungle Stories adventures of Ki-Gor. I have 37 Ki-Gor reprints, and several of them I never got around to reading. I'm afraid that if I ever do I'll need a magnifying glass. A big one. 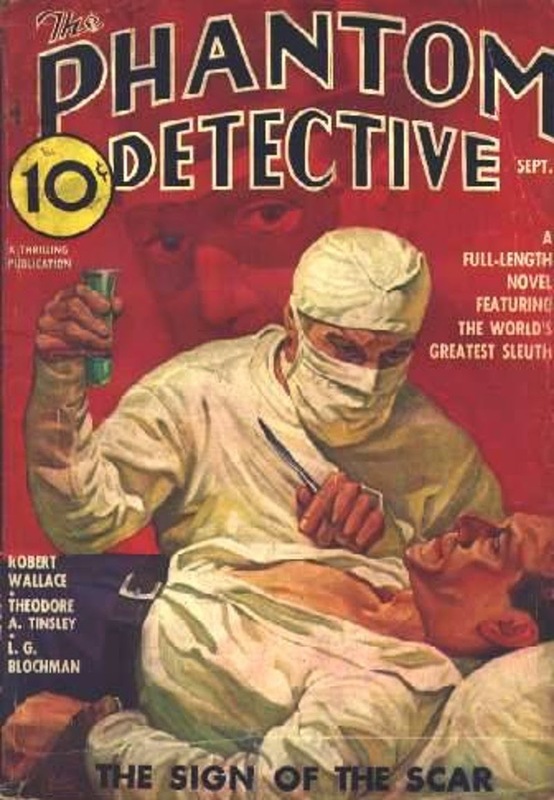 Re: the cover: I see the knife, but what's with the test tube? The Crimson Killer is one that I read, too, and I remember liking it a lot. As for the Ki-Gor novels, I have the first two Altus Press reprint volumes but have only read the first story. I've got to get back to them. Too many things I want to read! Tread carefully in the Ki-Gor jungle, James. If there's more uneven hero pulp series out there I sure haven't encountered it. The best ones have an outrageous lurid vigor while the worst seem written by authors who scorned both the story they were telling the the readers they were telling it to. In short, if you run into a weak Ki-Gor novel, don't give up. The good ones are well worth working your way around the bad. Don't recall this one but I read a bunch of Phantom Detective reprints in the really cool Corinth editions when I was in Basic Training at Ft. Leonard Wood way back in the mid-1960s.